P. flexilis var. albicaulis /Engelm./Engelm. Found as a broom, not so tight, healthy, 20’ up. JM text. 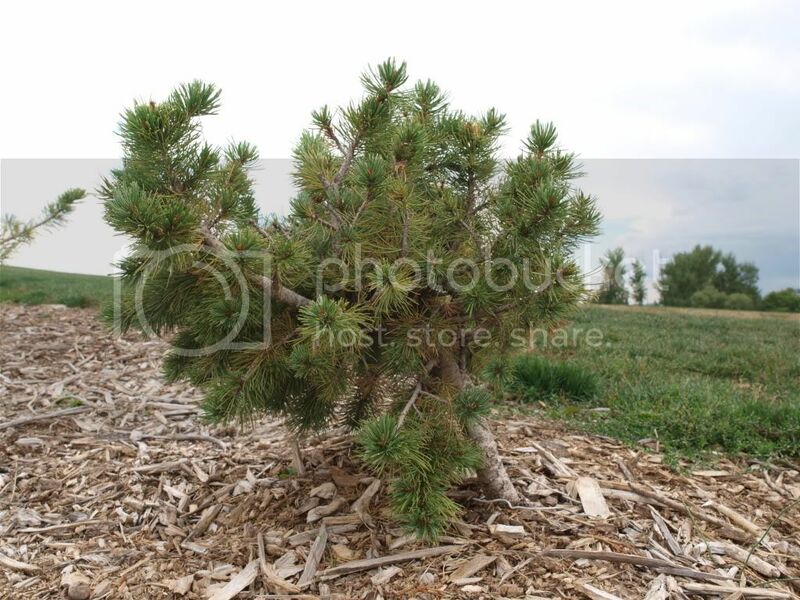 This slow-growing pine has a handsome form and a heavy texture. Thick, gray-green needles give a wonderful contrast to the prominent bark of this rare species. A choice dwarf for collectors or small gardens! Growth Rate: 3-5" HxW@10yrs: 3'x2'. Brent Markus text. Found as an old, tight broom. JM text. Found as a broom, large, 25’ up, good looking, growth 3-4”. Found as a broom in the USA. Found as a seedling, growth rate a year over 3 cm. Dwarf Whitebark Pine. Plant grows about 4-6 inches a year. Leaves are green-blue and coarse, plant upright and sparse. Stanley text. Introduced in 1965 from the Noble Collection it is dwarf and compact with grayish green needles. Arrowhead text. P. balfouriana var. aristata Engelm. north of Weston Pass. JM text. Very tight, yellowish, round, 3” x 3”, 10’ up. South of Weston Pass. JM text. Found as an average broom between 6-10’ up, large, old. Pinus aristata ’# 107’. JM text. Found as a broom 35’ up, 8’ x 8’, east of Kristin. JM text. 400 yds. east of Cabin. JM text. Silver Love # 65. JM text. looking for # 71. JM text. Limber Grove on left – see stacked rock – behind Aspen. north of # 114. JM text. near Red Hill Ranch, northeast of Barns in Sadole. Pinus aristata ’# 137’. JM text. low branches. Red Hill Ranch, east side. Pinus aristata ’# 141’. JM text. Found as a broom, tight, good, low branch on ground. to bottom up to Sadole. Pinus aristata ’# 142’. JM text. Found as a broom, looks like Curley or # 129 Ding Dong. Pinus aristata ’# 144’. JM text. texture, Red Hill ranch, northwestern corner. Pinus aristata ’# 146’. JM text. only one bud on most branches, some of them are hanging. 36”. Pinus aristata ’# 147’. JM text. before ridge of Red Hill ranch. Pinus aristata ’# 150’. JM text. Dwarf tree east of Curley. Pinus aristata ’# 154’. JM text. Found as a broom, yellow, east of Curley. JM text. Found in the Alma area. Pinus aristata ’# 157’. JM text. Pinus aristata ’# 158’. JM text. Found above Ancients to the left. Pinus aristata ’# 159’. JM text. Pinus aristata ’# 163’. JM text. Found as a broom, 6’ x 6’, 10’ up, 50 yds southeast of # 4. Pinus aristata ’# 5’. JM text. Pinus aristata ’# 164’. JM text. Broom, average, first north of Curley – uppon of 3. JM text. 4 miles road. JM text. One of the Seven Dwarfs Series from the Jerry Morris Rocky Mountain Conifer Collection. All Seven Dwarvs were found on a plateau around South Park, Colorado. Small needles and big buds with white resin on leaves. Stanley text. lower road to Mt. Evans. JM text. over 3-4 cm, needles 3 cm. 3 – 4 cm, délka jehlice 3 cm. Balatka text. do 3 cm. Rostliny jsou sledovány. Balatka text. Broom, average, 8’ up, 3’ x 3’. Just north of # 30. JM text. uphill 200 yds. JM text. Plant part of The Jerry Morris Rocky Mountain Collection. A dwarf plant that will not get more than 1 ft. high. Pitch on leaves. Stanley text. the road on left in flat. JM text. Found in the Bickelhaupt Arboretum Clinton IA USA. First harvested in January 2013 by conifer propagators. Pinus aristata (Bickelhaupt WB) is a witches broom located on a seedling-tree which was in 2012 donated to The Bickelhaupt Arboretum by Diane Dave of Iowa, USA. The broom/tree came to her as a purchase from Iseli Nursery, and she decided it would be best-situated at Bickelhaupt’s ’Heartland Collection’ located in Clinton, IA, USA. The first scions were cut during winter of 2013 by nurserymen and grafters, and the broom was given it's (provisional name) of (Bickelhaupt WB). It is possible this name may change in the future or, it may stay the same, hence the current (provisional) status. Dax Herbst text. A dwarf plant that will not get more than 1 ft. high. Pitch on leaves. Stanley text. Found as a broom, west of Curley, lower of 2’. JM text. Leaves blue-green and 1” long. Plant grows 1” a year with light resin. Stanley text. The handsome sap-flected blue-green needles of this selection make it a standout from the typical green bristlecone pine. 'Blue Bear' is a full sized grower with a nice tight, full branched growth habit. Plant in a well drained soil and give it plenty of sun. Once established you can expect 4-8" of annual growth. A superb cultivar selection made by Kirk Feiseler of Laporte Ave. Nursery in Ft. Collins, CO. Zones 3-7. A Laporte Ave. Nursery seedling selection about 25 years old. This tree is extremely thickly branched, with a blueish green coloring that is quite different from the normal green of most Bristlecones. A very healthy plant that maintains vigorous upright growth after grafting. Growth rate: 4-6”/year. Fieseler text. A seedling selection from Iseli Nursery, 'Blue Heron' has a narrow habit when young and a more open, pyramidal habit with age. A cultivar of the Great Basin Bristlecone Pine, a species known for extreme longevity, with specimens recorded at well over 4,000 years old, it makes a great choice for cold climates and long life. Iseli text. broom, 0,3 cm long needles. uphill from Mose Greek. JM text. slope as Kristin, but to the east. JM text. north of Happy. JM text. Found as a broom, tight, 15’ up, good, Tarryall road. JM text. Found as a broom, 6’ x6’, 8’ up, east of Democrat # 20. JM text. Found as a broom, 6’ x 8’, Red Hill ranch. Pinus aristata ’# 160’. JM text. west of Como exit. JM text. Broom 4’ x 4’, 15’ up, about 50 yds. north of Como. JM text. north side of road. JM text. Found as a broom, everything points up, 12’ tall, 6’ wide. Pinus aristata ’# 152’. JM text. Pinus aristata ’# 166’. JM text. Broom, 3’ x 3’, 12’ up, 10’ from # 35 in Alma area. JM text. Mt. Evans below road. JM text. Found as a broom, low on tree, north of Democrat. JM text. of Hwy # 285, on east side south of ranch. JM text. Pinus aristata ’# 138’. JM text. of Tarryall Res. on southern side of road. JM text. buds with white resin on leaves. Stanley text. Found as a broom, 30’ up, medium size. Half mile south of Engleman # 19 up hill 200 yds. JM text. on north of a doug fir broom. JM text. Leaves blue-green and 1 inch long. Plant in ball growing 1 inch a year. Stanley text. by ditch near rich. JM text. big buds with white resin on leaves. Stanley text. 2nd grove of PB’s. Up road past 1st road going right. JM text. Eagles Eyrie Campground, Squaw Pass. JM text. west of Goliath on Mt. Evans road. JM text. A dwarf, upright evergreen conifer with a narrow pyramidal habit. Silver blue-green needles are flecked with white resin. Discovered as a seedling by Ekstrom Nursery in Oregon. Prefers full sun in well-drained soil. 2' tall x 1' wide in 10 years. Hardy to -50 degrees. USDA zone 2. Buchholz text. Found as an old broom, tight, 6’ x 5’, north of Empire up to top. Pinus aristata ’# 120’. JM text. summit of Red Hill on knob. JM text. like a leaf of grasses, thin, blueish-bloomy such a long time. Juvenilis alak, a fiatalkori tűk szálasak, vékonyak, kékes-hamvasak – sok évig ilyenek is maradnak. Növekedése még lassabb, mint társáé. Egymás mellé ültetve mintha nem is ugyanaz a faj lennének. 5-6’ in diameter. JM text. yds (at Geneva Basin). Sign on road side. JM text. Pinus aristata ’# 139’. JM text. lower side of road on Mt. Evans road. Boswell type. JM text. first seen from road. JM text. A dwarf plant growing 1” a year. Leaves touched with resin. group on way east, up in tree. JM text. Broom – open – in shade on Red Hill Ridge, north of Clearing. Pinus aristata ’# 114’ JM text. Broom, fairly tight, large, 6’ x 5’, 15’ up, yellowish but healthy. Up Packer road up to right. JM text. on mountain, looking up from Cabin to left. JM text. Found as a broom by trail limber grove. JM text. south of # 4 along road. JM text. Broom on same tree as Cheery # 38, 10” x 8” on trunk at 6’. Found as a broom, 3’ x 3’, low, vigorous, good looking. 4 miles southeast of ’Low Boy’. JM text. Leaves bluish green and 1 inch long. Miniature ball, dusted with pitch. Stanley text. Red Hill Ridge. JM text. An Iseli seedling selection, this gorgeous Great Basin Bristlecone Pine is possibly the most refined pine we grow. It has a compact, uniform shape, larger than 'Sherwood Compacta', but smaller than 'Formal Form'. Dense clusters of two-toned needles point towards the tip of each ascending branch and create a consistent shape that hides the stems and buds until new growth emerges in late spring. Jean noted the origin of this beauty as 1975, and conifer great Joe Reis, given the task of naming the remarkable tree in 1982, chose to honor his wife Bess. It has proven difficult to propagate, but is worth the wait. The formal, slow-growing tree requires little or no pruning, but wants full sun. Iseli text. Upright mound, long needles, lots of resin. JM text. on Red Hill Ridge. JM text. Broom, average, 8’ up. 4 miles road south of Low Boy. JM text. east side of Clearing. JM text. Broom, 3’ x 3’, 15’ up, next to # 34. JM text. south of Clearing. JM text. Red Hill Ranch, north middle. Pinus aristata ’# 140’. JM text. Found as an average large broom, 6’ x 6’, 6’ up near Alma. Leaves green and 1 inch long. Dwarf ball growing 1-2 inches a year. Stanley text. down road from Alma on left. JM text. growing 2” a year. Leaves bluish 1” long and has resin. broom on south of # 6 about 80 yds. on curve on left. JM text. A dwarf growing 2” a year. Leaves bluish 1” long and has resin. Stanley text. & a little west. JM text. east from Beaver Creek by Fair Play. JM text. of # 8 Mosquito. JM text. Broom, tiny, 12”, pincushion tight, east of # 28 about 40’. Pinus aristata ’# 29’ JM text. South Weston road. JM text. Squaw Pass S. of Idaho Springs CO. Gardenweb, ’sluice’ text. on round bun. Plant grows 1” a year. Heavy resin, cones. 20” near small gulley. JM text. conical plant growing 2” ayear. No resin. Stanley text. at turn going up to top. JM text. healthy. West of Tarryall Res. uphill from road between 2 trees. green and 1 1/4 inch long. Dwarf ball growing 2 inches a year. Dusted with pitch. Stanley text. that will not get more than 1 ft. high. Pitch on leaves. way from Limber Grove parking area, 4 miles. JM text. plant growing 1 inch a year. Leaves resin, ½ inch long. Found as a broom, mostly yellow, 24” x 24”, 12’ up. Pinus aristata ’# 145’. JM text. Found as a broom, 15’ up, 3’ x 4’, above Alma. 200 years old, branches far apart, but where foliage is it is tight. and Itsy Bitsy. JM text. A dwarf form of Bristlecone Pine. This plant is part of the Jerry Morris Rocky Mountain Collection. Leaves are an emerald green with the needles facing upward with stem and shorter than species. All branches going upward. Stanley text. Found as a broom, 3’ x 4’, 35’ up, east of # 7.
and on road to the west. JM text. of parking area. JM text. C # 165, D # 166, E # 167, F # 168. Broom, 30” diameter, 20’ up, north of Como II. JM text. Broom 10’ up, 6’ x 6’, downhill to west of Varden. JM text. Kristin # 7. JM text. on left by two other brooms. JM text. lots of pitch. JM text. 50 yds. east of # 24. JM text. Found as a large broom, 6’ x 6’, rounded, much of it is weeping. South of Pinus flexilis ’Yellow’ – 4 mile road. JM text. A very dwarf mounding seedling found growing in the fields at Porterhowse Farms. Don Howse text. Broom, south of Red Ridge, 8’ up, on east side of tree. Pinus aristata ’# 161’. JM text. very green, thick. A short way south of Red Hill Mini. JM text. Found as a drawf tree, 18” + 18” wide, tight, short growth. At Cleaning at Saddle to south of Hiway Red Hill Pass. JM text. Ancients, about 200 yds. of # 152. JM text. When a cultivar bears the name of a conifer icon like Ed Rezek, you know it is among the best. Such is the case with this beautiful Great Basin Bristlecone Pine, named for Rezek's wife Maureen and originating from the same seed group as 'Joe's Bess'. It is a fine pine with a compact form, a little larger and more open than 'Joe's Bess', similar to 'Formal Form'. Dense clusters of two-toned needles point towards the tip of each ascending branch, hiding the stems and buds until new growth emerges in late spring. The formal, slow-growing tree requires little or no pruning, but needs full sun. Iseli text. 2 brooms, smallest one. (see 46). JM text. Found as a top broom, northwest of Barns, Red Hill Ranch. Pinus aristata ’# 136’. JM text. Found as a broom 20’ up, 24” x 24” globe, uniform texture. Tight, short needles. JM text. up Beaver Creek on road over to west. JM text. This handsome, slow-growing Great Basin Bristlecone Pine develops a perfectly conical shape and a dense, formal appearance. Tightly packed tufts of medium-long, green needles with white undersides radiate around the ascending branches of the long-lived conifer. Related to the oldest-living known organism, this selection was found and named by late Oregon nurseryman Andy Sherwood. Iseli text. of PB’s. Up road past 1st road going right. JM text. average on low limb. Red Hill ranch. Pinus aristata ’# 148’. JM text. Found as a broom, north of Sharons Star. JM text. Green leaves 1” long, Grows 1 1/2 “ a year. Stanley text. in area in west of Levi Alone. JM text. Morris and Rich Eyre. Needles thick and 1 ½ inch long. Resin. Grows 1” a year. Stanley text. Found as a dwarf tree, tight. JM text. Jerry Morris Rocky Mountain Collection. Stanley text. Found as a broom east of Silver Bug. JM text. needles than species and is a very small plant in sort of a globe. resin ducks. Globose dwarf plant. Stanley text. Broom, large, 15’ up, northwest of Mr. Right. JM text. Silver Dust # 67 in area of Levi Alone. JM text. on a expedition with Rich Eyre. Plant very small with large pitch resin on needles. Stanley text. Found as a broom, east of Levi Alone, accross road. JM text. Morris and Rich Eyre. Needles bluish and 1” long. Plant grows 2” a year. Stanley text. Found as a large broom, low, 10 ’ or so. Across from Betwixt. Morris and Rich Eyre. All different and dwarf. Most only 1 ft. in 10 years. Stanley text. Pinus aristata ’# 103’. JM text. Leaves dark, heavy resin 1 ¼” long. Grows 2” a year. Broom, small, low, above Silver Bug. JM text. smaller than the species on a small conical plant. of Levi Alone. JM text. Found as a tree, tight, bunch, upright. JM text. Dwarf tree, found north of Betwixt. JM text. to north of Silver Boy. JM text. Broom 6’ x 6’, 6’ low in area west of Levi Alone. JM text. Found as a broom accross from Betwixt. JM text. Morris and Rich Eyre. Resin like snow on blue leaves 1 ½”. Grows 2” a year. Stanley text. below Alma to first right on left. JM text. 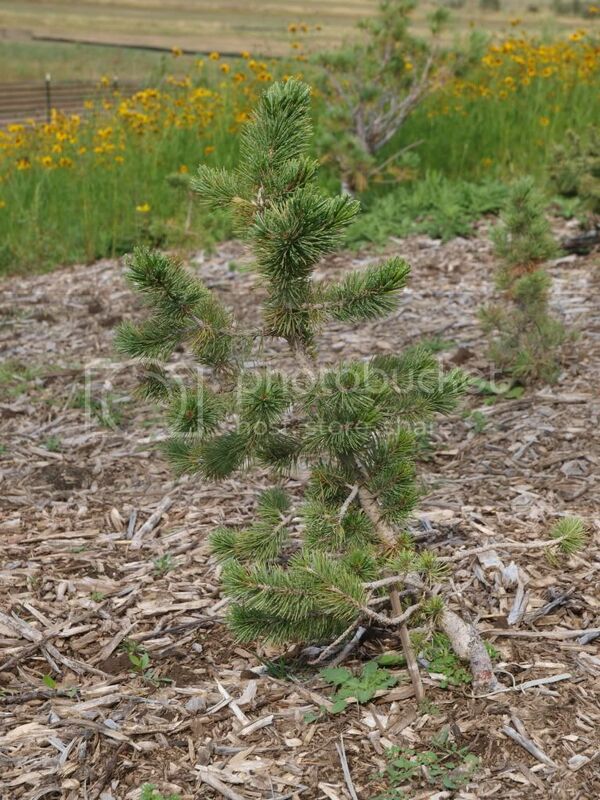 One of the Seven Dwarf Series from the Jerry Morris Rocky Mountain Conifer Collection. All Seven Dwarvs were found on a plateau around South Park, Colorado. Small needles and big buds with white resin on leaves. Stanley text. Found as a broom, 12” diameter, east of Kristin # 7. JM text. Beaver Creek and Fairplay. JM text. A miniature plant that grows ½ inch a year. Leaves ½ inch long. Stanley text. Packer road goes to Turner, 100 yds from So Tight. JM text. little to left. JM text. below „Between”. Road from Alma to Beaver Creek. JM text. Leaves green and ½ inch long. Stanley text. A gyantástűjű szálkásfenyő magszelekciója, amely – igaz, nagyon rossz talajon – 10 éves korára sem érte el az 1 méteres magasságot. Vastag, merev, fényes, enyhén görbülő mélyzöld tűk, nagy barnásvörös rügyek, végtelen szívósság jellemzi. Broom, 6’ x 8’, east of Kristin, 12’ up. JM text. one 3” limb is 288 years old. JM text. A dwarf plant that grows 3 inchs.a year. Leaves bluish, heavy resin, 1” long. Stanley text. Jerry reckons this tree is about 1,000 years old. up Packer to the right. JM text. Found as a seedling, growth rate over 3 cm a year. Semenáč na soukromé zahradě. Pan Tlatla, Prusice. Broom, found on north end Windy Ridge, low, very tight. Just south of # 45. JM text. Leaves dark blue, heavy resin, ½ inch long. Stanley text. up Beaver Creek. JM text. west of # 19 Putnam. JM text. Found as a pendulous seedling, growth rate over 3 cm a year. poléhavý, po vyvázání se chová jako Pendula. north side of road across from a campground. JM text. Found as a broom, very tight, a little yellow. Pinus aristata ’# 143’. JM text. Alma # 5. JM text.